Mme Samnol (Nov Srey Leab), Kossomak (Horn Sophea), Mom Savay (Chea Ravy). © Michèle Laurent, 2013. Saloth Sâr (Chea Ravy) et Sihanouk (San Marady). ⓒ Michèle Laurent, 2013. 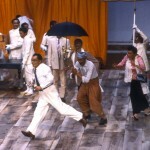 L’histoire terrible de N. Sihanouk, 1985 ⓒ Michèle Laurent. Gal. Abrams (S. Abkarian), H. Kissinger (S. Poncelet), M. Laird (J.F. Dusigne). ⓒ Martine Franck, Magnum Photos. The First Epoch of the terrible story … starts in 1955. Norodom Sihanouk, 32 years old has been reigning on Cambodia for the past 14 years when he decides to abdicate in order to concentrate on politics. The following year, Cambodia enters the movement of non-aligned countries, which leads to tense diplomatic relations with the two blocks. The Second Epoch begins in November 1970, it really makes the Khmer Rouge enter the scene and recounts the terrible massacres that followed the fall of Phnom Penh (April 17, 1975). 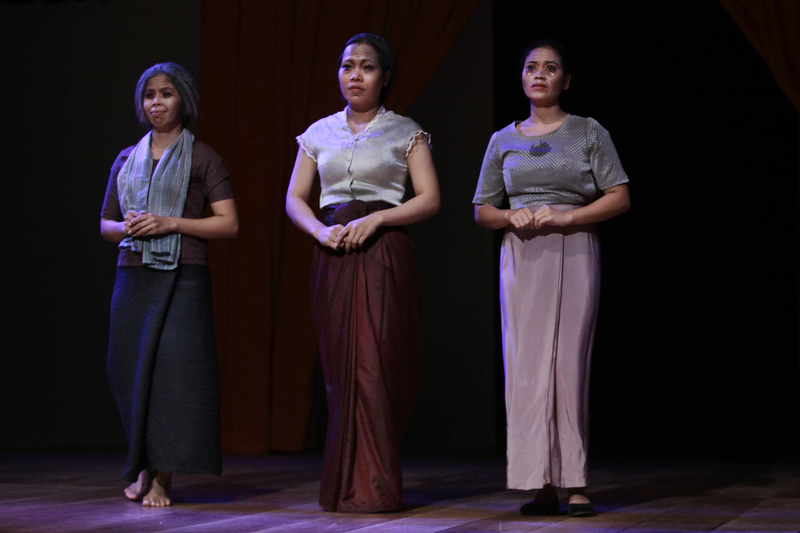 The play ends in 1979, when the Vietnamese army enters Phnom Penh to “liberate” the country that has just undergone for four years the Khmer Rouge’s madness. 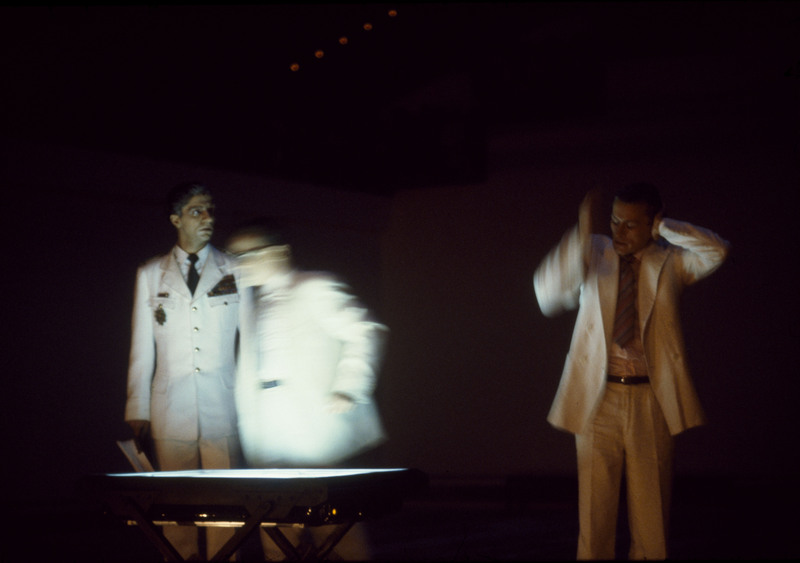 1955-1974 : our play lasts 24 years in a few hours. 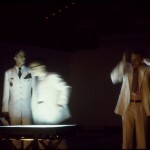 There are 50 tableau. All are fictitious. All could have happened in reality. The sequel to our story is a perilous one. The world rocks beneath one’s feet. The stars have dropped from the sky. Up there the gods have been throwing the dice. Some have won. Some have lost and are desolate. The camp we live in is one of desolation. And it’s hard to tell what our leading characters are thinking. It’s time of mistrust. A cold sun is rising in the North. No more kingdom, no memories left. On every side destiny reigns. Which popes or Papas now should be disobeyed. A sharp-toothed era has torn this land to pieces. And I hope I won’t forget a single shred. 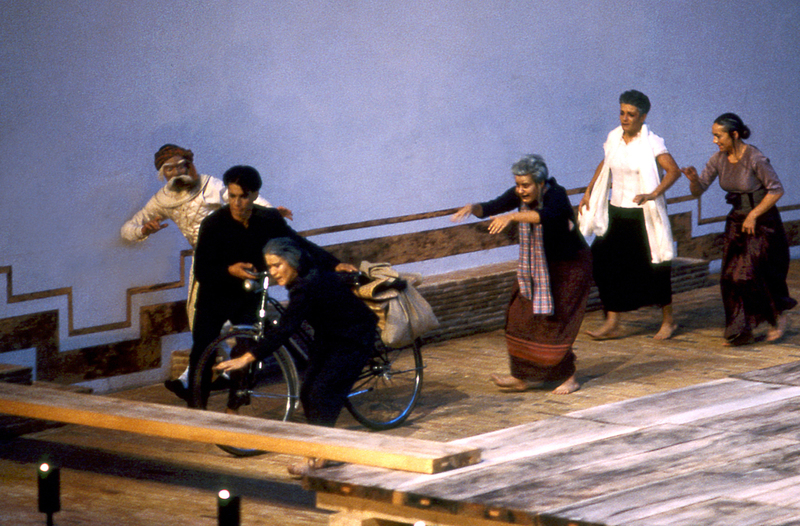 Mme Lamné (Clémentine Yelnik), Mme Khieu Samnol (Myriam Azencot) ⓒ Michèle Laurent, 1985. Mme Lamné (Pin Sreybo) ⓒ Michèle Laurent, 2013. 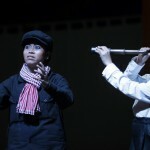 Long Boret, Sirik Matak et Saukam Khoy ⓒ Michèle Laurent, 2011. 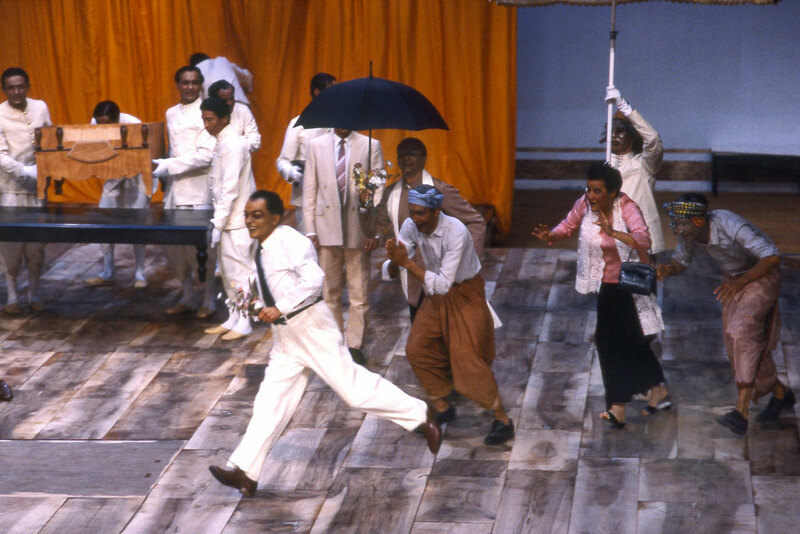 Sihanouk, (Georges Bigot) un paysan (Zinedine Soualem), Mme Khieu Samnol (Myriam Azencot) un paysan (Simon Abkarian) dans la mise en scène d’Ariane Mnouchkine,1985. La historia terrible, pero inacabada, de Norodom Sihanuk, rey de Camboya. Today is a holiday in Cambodia. An ancient custom holds that on this day the people may present their grievances to King Sihanouk, who tries to find fair and popular solutions. A farmer comes forward to complain about drought, another about being forced off his land by the construction of a sugar refinery. Sihanouk orders that the refinery be built elsewhere, which angers the American ambassador, McClintock, and his own cousin, Sirik Matak. 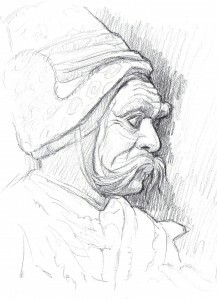 Les Paysans ⓒ Marie-Ange Barbet, 2013. Khieu Samphan, a graduate of the University of Paris, demands the King explain why it is necessary to be recommended by the Palace in order to work at the university. Sihanouk gets angry at the Marxist students and has Khieu Samphan thrown out, abruptly ending the ceremony. 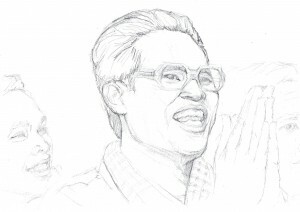 Another Communist student, Saloth Sar, rebukes Khieu Samphan for his actions. Khieu Samphan’s mother, Khieu Samnol, does not understand her son’s behavior. She tells him to go back home with her. Saloth Sar glorifies hate, which will become key to the creation of a new Cambodia. Sihanouk goes to the sanctuary of his ancestors to talk to his late father, Suramarit. He asks him about the complex situation the country is in. The date of the free elections approaches. Many parties hope to gain power. Sihanouk complains about the Americans while his father blames the situation on the Vietnamese, long-standing enemies of the Khmer people. Suramarit, stunned, listens to Sihanouk’s secret, subtle plan to abdicate and create a political party allowing him to win the elections and stay in power. McClintock, the American ambassador, criticizes Sihanouk for being unreasonable in summoning everyone in the middle of the night to be present at his abdication. Sirik Matak speaks of his hatred of Sihanouk, who abdicated in favor of his mother. Sihanouk challenges his cousin and reaffirms Cambodia’s total and exemplary neutrality. Sirik Matak believes the monarchy is in decline, and prays the gods make him the last king of Cambodia, even if only for a single day. Sirik Matak ⓒ Marie-Ange Barbet, 2013. Sihanouk informs his father of his victory at the elections. He tells him he has proved his “democratic” tolerance by appointing three Communist ministers, including Khieu Samphan as Minister of the Economy. Suramarit urges him to be careful. Khieu Samnol complains about her son seeing his friends. He has changed so much that she hardly knows him. Saloth Sar and Khieu Samphan no longer agree on the political line to take under the new circumstances. Hou Youn agrees with Khieu Samphan. Saloth Sar decides to join the guerrillas in order to support the nascent Cambodian revolution. Saloth Sar et Khieu Samphan ⓒ Marie-Ange Barbet, 2013. Sihanouk has a meeting with the American ambassador. He accuses McClintock of having ulterior motives and complains about his humiliating actions against Cambodia. The tension rises. Sihanouk says the current American military aid is useless because it does not allow him to defend the country against systematic incursions by the Vietnamese, who are also getting military aid from Washington. As a consequence, Sihanouk solemnly announces the suspension of political and military relations with the United States, in order to preserve the neutrality of Cambodia. Queen Kossomak expresses doubts about her son’s decision. “You must reign, Mother. let me do the driving” Sihanouk replies. 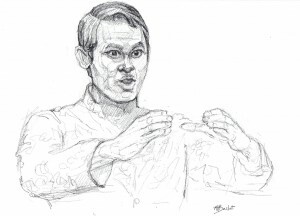 Sihanouk rebukes McClintock about an article published in Newsweek. McClintock swears the United States will make Sihanouk pay for his decision. Sihanouk ⓒ Marie-Ange Barbet, 2013. General Lon Nol plans to take advantage of the unrest in Battambang Province to get the Prince away from the Communists. On the night of his birthday Sihanouk gazes at the stars, accompanied by his minister Penn Nouth. Sihanouk names the stars for people he admires: Mozart, Nehru, De Gaulle. General Lon Nol arrives to wish Sihanouk a happy birthday, and speaks to him of the unrest in Battambang Province, where the crowds called Sihanouk a traitor and a thief. Ten members of the Royal Guard were killed. Lon Nol says he thinks the rebellion was organized by the Communists. Sihanouk does not understand the actions of his Communist ministers (“To be Minister and rebel, that’s pushing treacherous hypocrisy too far ?”), and orders Lon Nol to execute those responsible. Penn Nouth disapproves of Sihanouk’s decision, fearing Lon Nol would repress the rebellion too harshly. Hou Youn expresses his surprise to Khieu Samphan about the Prince accusing them of being Chinese spies and organizing the rebellion in Battambang Province. Khieu Samphan considers the rebellion a victory even though they were not involved in it. The three hundred dead caused by Lon Nol’s repression do not matter to Khieu Samphan, only victory does. Hou Youn and Khieu Samphan decide to join the guerrilla and to spread a rumor that Sihanouk had them assassinated. 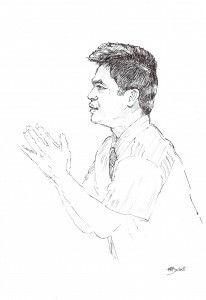 Khieu Samphan ⓒ Marie-Ange Barbet, 2013. Advisor Kissinger and General Abrams discuss the military situation in Cambodia. Abrams announces that he intends to bombard the North-East Cambodian border to get rid of pockets of North Vietnamese resistance. Sihanouk may want to remain neutral, but according to General Abrams, he will have to choose between “pro-Communist neutrality and pro-American neutrality”. Kissinger asks Melvin Laird, the Defense Secretary recently returned from Cambodia, for his opinion. Laird says that Sihanouk is ready to resume diplomatic relations with the United States, under the condition that the Americans recognize the inviolability of his country’s borders. Laird, who does not consider the Cambodian Communists a threat, advises Kissinger to accept. He thinks the Vietnamese infiltration is not very strong. However, Kissinger decides to let Abrams bombard the border anyway, against both Laird’s advice and Congress, which he did not inform of his decision. Laird feels bitter and alone. Penn Nouth is ill. Queen Kossomak reproaches him for being so at such a difficult time for the country. Sihanouk returns from an expedition to the Vietnamese border. He says he saw deserted towns displaying portraits of Ho Chi Minh. Sihanouk appoints Lon Nol as his new Prime Minister. Penn Nouth advises Sihanouk to be careful and to not rush or he would lose the support of the people. Sirik Matak announces the death of Ho Chi Minh. Sihanouk decides to go to the funeral in Hanoi despite the disapproval of the people. Sirik Matak disapproves of his cousin’s decision, but is glad to have the chance to plot his downfall. Sihanouk feels “alone, weary and totally discouraged”. Despite being ill, Penn Nouth arrives to inform him about the state of Cambodia: Lon Nol took Penn Nouth’s ill health as a pretext to appoint Sirik Matak Prime Minister. A coup d’état is imminent. Sihanouk is not overly worried about the situation, because the coup cannot succeed without the support of the armed forces and of Lon Nol. Sihanouk is certain General Lon Nol will not betray him. He thinks the real threat lies in Vietnamese troops advancing deeper inside Cambodian territory, forced there by the American bombing. Sihanouk decides to travel to Moscow and Beijing in order to get help which might stop the invasion. To give his arguments more weight, he asks Lon Nol to organize popular anti-Vietnamese protests in Phnom Penh. The Cambodian Ambassador in Paris expresses his confusion about the Prince’s political decisions. Lon Nol ⓒ Marie-Ange Barbet, 2013. With the help of a servant, Khieu Samnol and her Vietnamese friend Madame Lamné seek safety in a Royal Palace patio from the anti-Vietnamese riots sweeping the city. Queen Kossomak and Mom Savay, a former royal dancer, meet Hawkins, an American civil servant. He tries to convince the Queen to stop her son from returning, or he would fall into the plotters’ trap. Mom Savay disagrees; she wants the Prince to return. The two women hiding are found, and speak of their fear to the Queen. Khieu Samnol begs the Queen to make her son come back. The Cambodian Ambassador in Paris announces to Sihanouk that a message has arrived from his mother, who describes the disorder and confusion in the country. Outraged, Sihanouk decides to cancel his plans and to return to Phnom Penh. The Ambassador gives him another message which contradicts the first. Penn Nouth is reassured, and Sihanouk calms down and decides to leave for Moscow. Sihanouk’s wife, Princess Monique, is wary about the trip. Kissinger ⓒ Marie-Ange Barbet, 2013. Kissinger informs Abrams that Nixon has given him carte blanche to bombard Cambodian territory. Laird opposes this decision. Kissinger insists. He wants to end the war in Vietnam once and for all. The Soviets only give Sihanouk vague promises of military aid in six or eight months. Sihanouk thinks about his country. Just as he is about to leave Moscow, Kosygin tells him he has been deposed. Sihanouk rebukes Chea San, the Cambodian Ambassador in Moscow, for his silence despite being aware of the situation. Queen Kossomak blames herself for not having convinced her son to come back. A messenger from Lon Nol asks the Queen to pardon those behind the coup. The Queen refuses, and replies to Lon Nol with two predictions: that he and Sirik Matak will fight over power, and that his legs will no longer obey him. Kossomak ⓒ Marie-Ange Barbet, 2013. Sihanouk misses his country. He manages to forget his cares in a private moment with Princess Monique. Zhou Enlai waits for Sihanouk. The Cambodian Ambassador in Beijing officially informs him that the Prince has been deposed. Zhou Enlai asks Liu Kiang to go to Cambodia to ensure that the agreements signed with Sihanouk will remain in place under Lon Nol. Zhou Enlai rebukes Sihanouk for not having asked for Chinese help from the start. Sihanouk leaves the meeting with Zhou Enlai. He doubts the loyalty of the Chinese, and thinks of going into exile in France. Penn Nouth gives him bad news about Cambodia: all the ambassadors have declared themselves loyal to Lon Nol except for Chea San in Moscow, and a national campaign is maligning Sihanouk and his family. His honor insulted, Sihanouk decides to fight. He accepts Zhou Enlai’s suggestion to ally himself with the North Vietnamese. In order to get help from the West, Penn Nouth asks Manac’h to speak in their favor to France and the United States. Finally, he implores the spirits to watch over Cambodia. The late King Suramarit speaks of the misfortunes of Cambodia and its people. 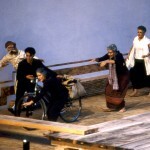 Khieu Samnol and Madame Lamné enter, walking a bicycle whose wheels constantly deflate. They think they might be able to sell it to a Chinese man. 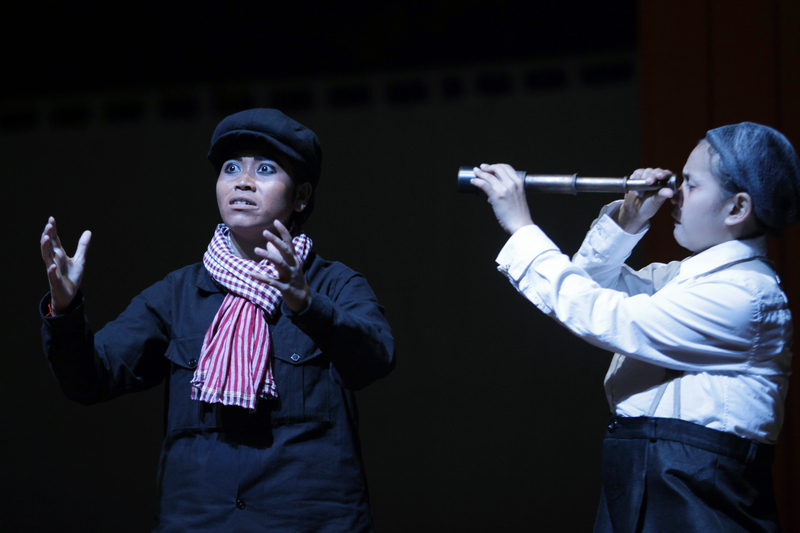 Khieu Samnol reveals to her friend the secret words which call up the spirits of the dead. Suramarit appears immediately and asks to borrow the bicycle so he may go to Beijing to see his son. Sihanouk takes stock of the situation. He lives in exile in Beijing, where he is about to ally himself with his people’s long-standing enemies the Vietnamese against Lon Nol’s government, which has the support of the Americans. Pham Van Dong, Prime Minister of North Vietnam, promises to respect the Cambodian border in exchange for an alliance. Penn Nouth does not trust him. Khieu Samphan and Hou Youn, who everyone thought were dead, arrive to pledge their unconditional support of the Prince. Sihanouk decides to immediately found the Royal Government of National Union. 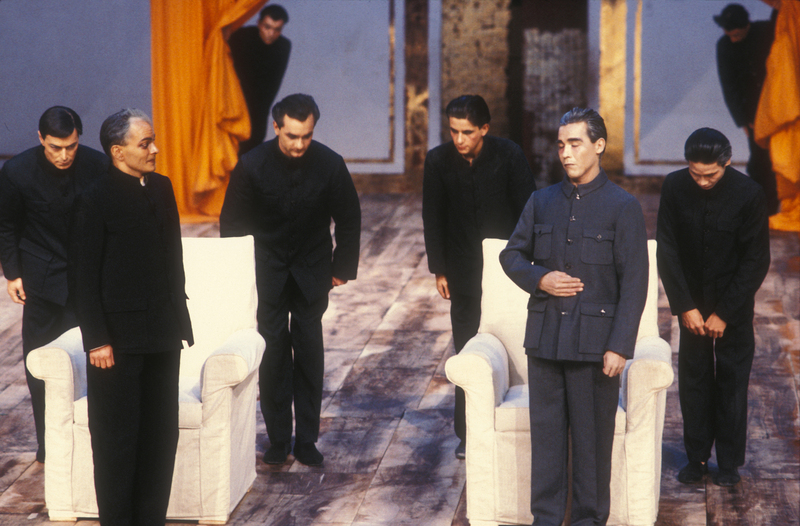 Suramarit arrives in Beijing and rebukes his son for his new alliances. Etienne Manac’h, the French Ambassador in Beijing, informs Sihanouk that neither France nor the United States will support him. The Prince realizes that he has no other choice but to fight. He summons his new Khmer Rouge ministers, but they have already left without the Prince’s authorization, saying that the fight must be fought from within Cambodia, with Sihanouk in a symbolic role in Beijing. Sihanouk feels utterly abandoned, but does not lose hope. 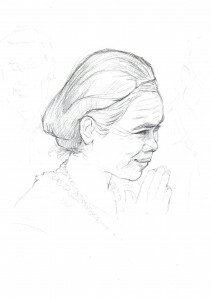 Khieu Samnol returns home with a young refugee from the American bombing that King Suramarit told her to help. She and Madame Lamné adopt him and call him Yukanthor. Sirik Matak and Chen Heng, President of the National Assembly, are worried and disappointed in the military defeats of Lon Nol’s army. Lon Nol says he will never give up. He refuses Sirik Matak’s request that he free Queen Kossomak so she may leave the country. While everyone gets ready to celebrate the rare victory of the Battle of Kompong Thon, Colonel Um Savuth’s messenger returns from the front with the information that it was actually a terrible defeat. Sirik Matak asks Lon Nol to resign. Lon Nol dissolves the National Assembly. Sirik Matak resigns. Lon Nol writes another letter to President Nixon. Sihanouk and Captain Ong Meang take stock of the past three years in exile in Beijing. Lon Nol remains in power thanks to internal conflict between the Khmer Rouge and the Vietnamese. Sihanouk knows that if Zhou Enlai dies, he will no longer have any support. Penn Nouth finally has good news: the Prince and Princess are now authorized to return to Cambodia for a few weeks. La Princesse ⓒ Marie-Ange Barbet, 2013. Lon Nol tells his Prime Minister Long Boret that “ the dragon of monarchy must have it’s throat cut, we must drain it of it’s last drop of blood!”, and orders him to have Sirik Matak arrested. The American Ambassador John Gunther Dean does not approve of Lon Nol’s actions, and demands an explanation about the incredible level of corruption in his army. Officers sell weapons donated by the Americans to the Khmer Rouge, and retain their own soldiers’ wages. Lon Nol’s army is much smaller than he admits to the Americans. The extremely young age of the Khmer Rouge soldiers shocks Sihanouk, who is uneasy to see their superiors use his name and image to manipulate them. 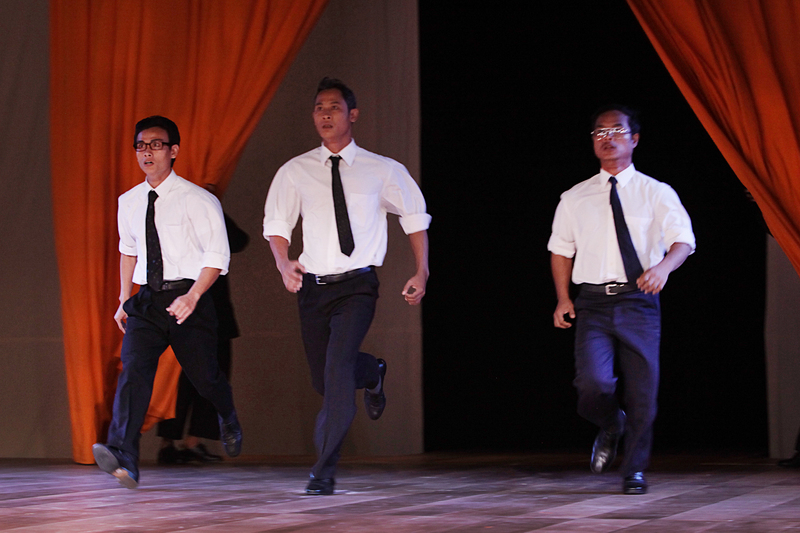 The Khmer Rouge leaders hatch a plan to destroy the old system to its roots. Khieu Samphan hopes to reach the gates of Phnom Penh in six weeks. Ambassador Dean asks Senator McCloskey once again to speak in Congress about Cambodia so the country is not abandoned to its fate. Dean tells McCloskey of the massacre committed by the Khmer Rouge in the town of Sarsar Sdam, and tells him that the Khmer Rouge revolution will be bloody. McCloskey thinks Lon Nol’s resignation would be a good thing for Cambodia. While Long Boret is summoned, McCloskey negotiates Lon Nol’s resignation over the phone. Saukham Khoy, Lon Nol’s successor as President, is confident the Khmer Rouge will end their abuses once they gain power because they just announced they will only pursue the seven main leaders, including Long Boret. Lon Nol agrees to leave for the United States in exchange for a million dollars. Keeley, Ambassador Dean’s secretary, announces the fall of Neak Luong. The Khmer Rouge are at the gates of Phnom Penh. Sihanouk knows that the first to arrive in Phnom Penh will rule over Cambodia. He is convinced he can reverse the situation if he arrives before the Khmer Rouge. He asks for American help via Manac’h. He must act with care due to the bugs planted by the Khmer Rouge all along the Great Wall of China. The Khmer Rouge dream has finally come true: they take Phnom Penh and decide to evacuate the city of its two and a half million people. Hou Youn is against this. He does not understand his peers. They have family and friends in Phnom Penh. 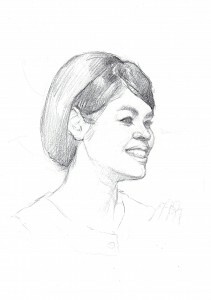 Khieu Samphan’s own mother lives in the city. “You believe it will take less time to evacuate than to set up a new administration ? Two and a half million people ? How long will it take to arrange transport, provisions, reception centres ? ” Hou Youn is silenced. Pol Pot decides to put into action his project to evacuate the city, and once victory is achieved, to eliminate Hou Youn. 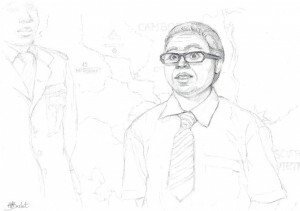 Pol Pot ⓒ Marie-Ange Barbet, 2013. The special envoy to Washington informs Penn Nouth that President Ford and Advisor Kissinger wish for Sihanouk to return to Cambodia. Sirik Matak agrees. A secretary announces that the Americans are leaving Phnom Penh, which is about to fall to the Khmer Rouge. 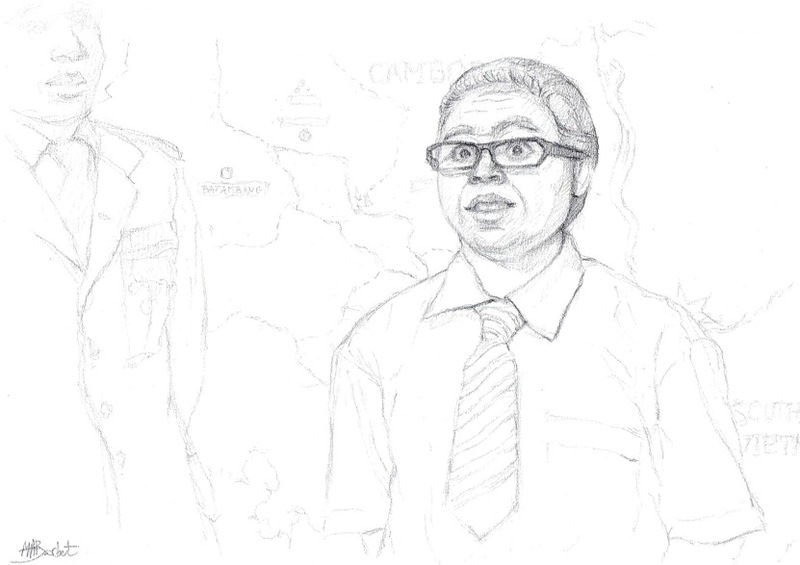 Prince Sirik Matak, Long Boret and Saukham Khoy speak of the imminent victory of the Khmer Rouge. Ambassador Dean tells them they may leave for Thailand on American helicopters. Sirik Matak refuses: “It’s not death to die for the country of your birth, it’s finding your mother again.” Long Boret also refuses. Only Saukham Khoy accepts the offer. Yukanthor, Khieu Samnol and Madame Lamné watch the victorious Khmer Rouge arrive in Phnom Penh. The people believe Sihanouk will also return to Cambodia. Loudspeakers give the order to leave the city immediately. 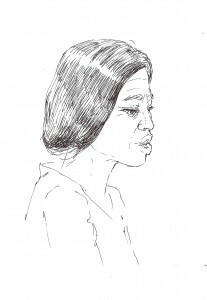 The ghost of Hou Youn describes the evacuation of the people, and how death came to Cambodia on this day, 17 April 1975. Zhou Enlai summons Sihanouk. The Prince can no longer stand being a Khmer Rouge puppet, and wants to leave for Korea. 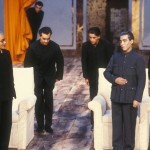 Zhou Enlai tries to discourage him, and urges him to return to Cambodia. Once alone, the two Khmer Rouge leaders agree that when Zhou Enlai dies, they will be able to keep Sihanouk prisoner in Cambodia and make good use of him. Khieu Samnol and Madame Lamné despair of the many deaths which every day brings. 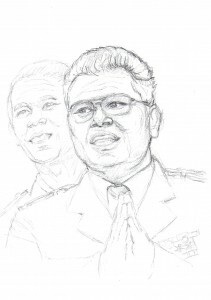 Contradictory rumors abound on the return of Sihanouk and his probable imprisonment. 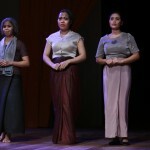 The two women summon the spirit of the late Queen Kossomak, who appears to comfort them along with Mom Savay, murdered by the Khmer Rouge. The Queen comes up with a plan for the women to get food, because they only have one hundred dollars left and money is no longer used in Cambodia. They make a Chinese man, Chang, believe that relations with Thailand have been reestablished and that dollars will circulate again soon. 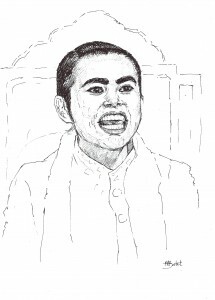 Chang offers them twenty sacks of rice, which they refuse. He then offers them forty, which they accept. The Queen’s plan was a success. The ghost of Hou Youn wanders in search of his brother. Khieu Samphan takes Sihanouk, his wife and Penn Nouth to visit the labor camps. He extols the virtues of the Khmer Rouge revolution. Yukanthor greets Sihanouk, sure that the situation will improve with his presence. The Prince realizes the danger Yukanthor is in, and pushes him away. Sihanouk wants to resign. He feels shocked and useless, unable to do anything to help the thousands of forced laborers and end the oppression ruling his country. He wants to reveal the truth. The Princess and Penn Nouth take him with him. Khieu Samphan threatens to kill Sihanouk’s family and followers if he resigns. Penn Nouth ⓒ Marie-Ange Barbet, 2013. Sihanouk has sent his letter of resignation to the Khmer Rouge. Princess Monique panics. Penn Nouth talks to Sihanouk. He tries to dissuade him, because if he resigns he will be imprisoned. Sihanouk refuses. Penn Nouth confesses to Sihanouk that he agreed to collaborate with the Khmer Rouge in order to protect his family. Finally, they part, promising to communicate “via the stars”. Captain Ong Meang pledges his loyalty to the Prince again, despite the danger. Madame Lamné has Khieu Samnol repeat her political lessons, though Khieu Samnol is not paying attention. She can hear faint music. It is the bells of Buddha. The dead are calling to her. Khieu Samnol dies, blessing her friend and Yukanthor. 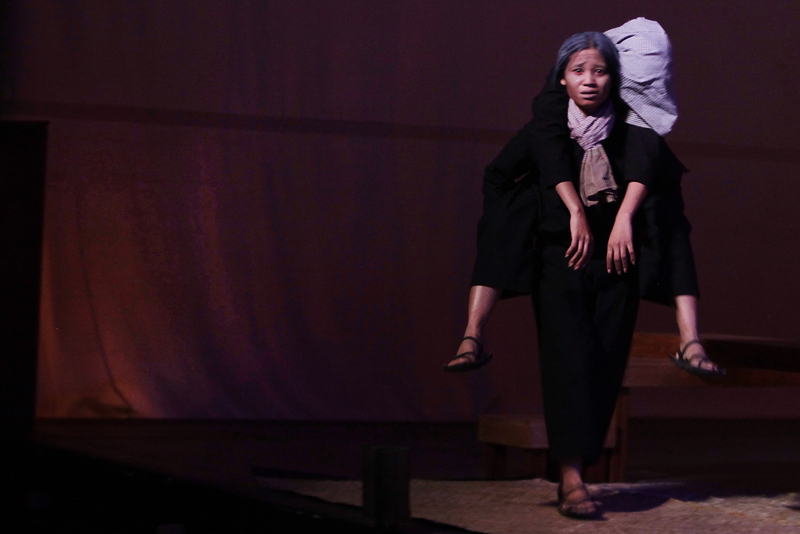 Madame Lamné’s cries of grief attract the attention of a kamaphibal, a Khmer Rouge guard. 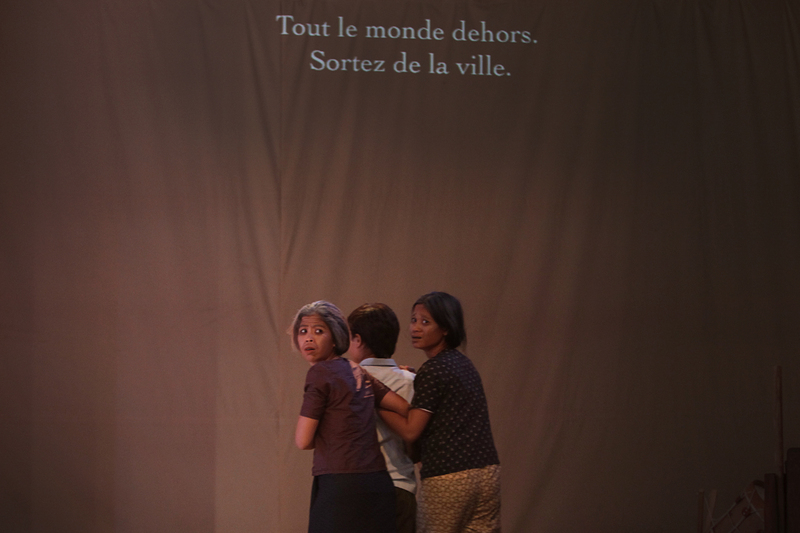 Hou Youn’s ghost appears just in time to prevent him from murdering Madame Lamné. Yukanthor then kills the kamaphibal. Madame Lamné weeps at the state of Vietnam and Cambodia. Madame Lamné ⓒ Marie-Ange Barbet, 2013. Sihanouk is a prisoner. He writes a letter to Khieu Samphan in which he demands to see his family. The Khmer Rouge order all personnel to immediately leave the Royal Palace. Sihanouk and the Princess think their end is near. Suramarit prevents his son from killing himself. He tells him the Vietnamese have declared war on the Khmer Rouge. Sihanouk understands that Pol Pot’s regime has delivered Cambodia to Vietnam. Khieu Samphan takes Sihanouk to see Pol Pot. Suramarit ⓒ Marie-Ange Barbet, 2013. General Giap and General Van Tien Dung discuss the military situation: Cambodia will be Vietnamese and under the command of the former Khmer Rouge leader Heng Samrin. While they wait for Pol Pot, Sihanouk and the Princess enjoy seeing the Mekong again. Penn Nouth arrives. He believes Sihanouk returned all his letters unread over the past three years, and rebukes him for it. The Princess assures him Sihanouk never got his letters at all. The Vietnamese troops are advancing. Pol Pot suggests Sihanouk go to Beijing with the Princess and Penn Nouth, and then to the UN to tell the world of the injustice of the Vietnamese invasion. Sihanouk takes stock of the situation. Miraculously, he is still alive. He wishes to retire and write the history of his country while living far from Asia and its demons. But if his people need him, they will find him. The dead say goodbye one last time to Madame Lamné and Yukanthor, who flee to Thailand. Only the dead remain, waiting for the return of their loved ones scattered throughout the world.